Next weekend I'm running a WFB 8th edition game at the game club's Game Day 23. Most of the participants have either not played 8th edition yet, or have only a small number of games under their belt. That includes me. So my friend Rich & I playtested the game this past Sunday. I tried to keep the armies somewhat simple, with just a few heroes with limited magic items. I wanted to have some of the cool toys from each army, though. As is the theme of 8th edition, the game was pretty random throughout. The game swung back and forth, with both of us more or less at the mercy of the dice. 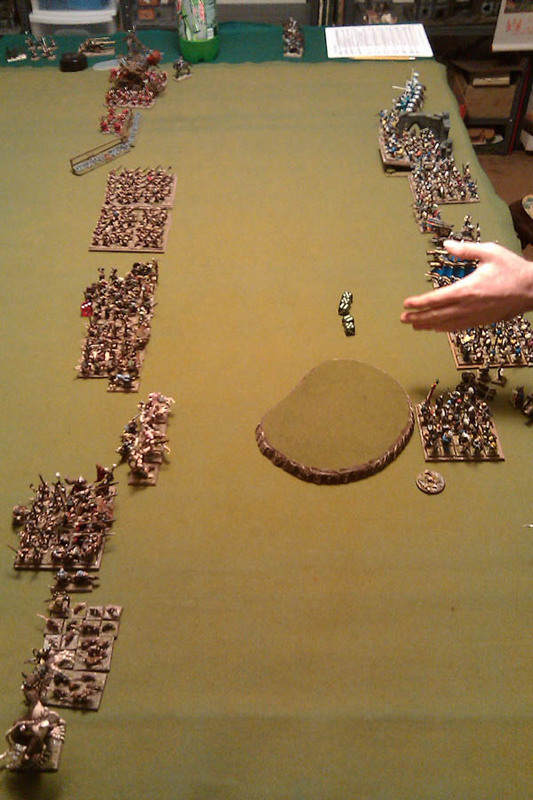 By the time we called it, the Skaven looked to be winning by a small margin. It's hard to judge when a couple rolls of the dice can completely change the outlook, though. I've been playing WFB for 6 of its 8 editions and believe that until this point it only improved with each revision. I'm going to give 8th edition at least a half dozen more games. So far, however, I'm pretty dissatisfied. I simply don't feel like it's as fun (for me) as past editions. That contrasts with some of the other games I've read or played recently (Black Powder, Crusader, or even WAB2) which have seemed much more rewarding & entertaining. I would not expect your impression to change at all. I've got about half a dozen games of 8th in - they all feel like endless dice rolling sessions. The matches all play like a video game - push the units forward, wait for them to do something. If I wanted that, I could just go play Total War. Close combat-much improved with a degradation in cavalry and characters which is a good thing,although stubborn to the flanks is absurd. The over all effect is a grind game over what used to be the all important charge and break. Magic-Improved as caps limit the arms race,but the spells are more brutal when successful. Line of sight is a joke and really is why to simplified. Templated War machines are ludicrously hard. Manoeuvre while easier is simply farcical as troops glide over the table like ghosts without bothering with effects of terrain. Basically,your dissatisfied,because like myself we are just to old for this gaming system which is now totally geared for the kiddies.WHFB was at it's best at 3rd edition as has steadily gone down hill as the rules have more and more catered towards the younger folks out there. All of this of course is IMHO. This edition is pretty much the last straw and I'll stay with my historical rules. i have played 6th edition and now 8th edition (with alot of games under my belt). honestly i have to say, man up things change. the all important charge is just that - still important. its just more random like the rest of the game. rolling lots of dice is fun.I don't know why you would play a game like this if you dont want to roll dice. i implore you to give 8th a few more tries. it sounds like you have quite the variety of army choices. stick to one! learn it (or relearn it). Rolling dice is fun. So is being rewarded for maneuver and tactically intelligent play. When the game becomes dominated by army selection (as it started to towards the end of 7th edition) and dice rolling (as it is in 8th) then the tactical decisions become less important. Luck -- in the form of dice rolling -- is a sliding scale. At some point there is a threshold for each player for when it becomes too much. WFB 8th is bordering on that threshold for me. There is also a difference in the way in which dice are used. There is the "Buckets o' Dice" type game, of which Warmaster is a good example, and there is a "Dice Roll For Every Action" type of game, such as Gorkamorka. I enjoy the former quite a bit, while the latter annoyed most of my gaming group and was quickly abandoned. The reason is the way in which the dice are used. In Warmaster, the buckets o' dice are a group roll to determine combats, and tend to average out a little. There are other rolls (command) but decision making is still generally in the hands of the players. In Gorkamorka you rolled one or two dice for every stange of the game, and for each shot you took, you potentially rolled a monotonous series of rolls, consulted pretty random tables, and in the end there was really no telling what would happen. You could roll a die in a series of 8 rolls only to discover that nothing happened. The dice were more important than the players decision, more important than the weapon, the target, etc. WFB is somewhere in between. But the balance is turning. It's not just the dice, though. The focus remains on big monsters and big spells determining the outcome of games. While it is a fantasy game, I do appreciate some common sense realism. Terrain no longer acts like terrain, but more like a spell. Maneuver and reforming is so free-wheeling and simplified that it require much thought or planning. I guess to me, the game has become abstracted and random to the point that it doesn't have the feel of an epic battle between fantasy armies anymore. And that's what got me into WFB in the first place.